I had a customer of mine that a single user inside their office needed an 800 number routed to them…not a big deal. What we did was to order an additional DID from their SIP provider Vitelity. The number was provisioned and I forwarded it from the incoming trunk to the users phone. I made a test call and low and behold, it worked just fine. That was a boring story… Every good story has to have an antagonist, right? Well, when you picked up the phone to dial out, it was screened on caller ID as a number from the old DID block. I tried just manipulating the Outbound CID section. I set it to what the new DID is, but it still didn’t do the trick. After futzing with that for a while I put in a support ticket. Support told me to put in a subaccount. A subaccount creates a new set of trunk credentials for one to use. 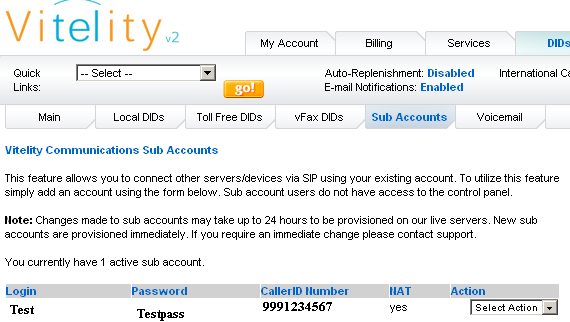 You also associate a caller ID with the new subaccount, which will, supposedly, screen the number properly. 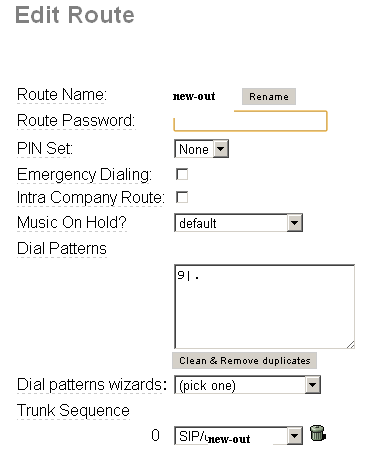 Since we have a new set of trunk credentials, we have to create a new trunk in our asterisk server. My box is a trixbox ce server. I basically used my existing trunk settings, but with the new username/password. 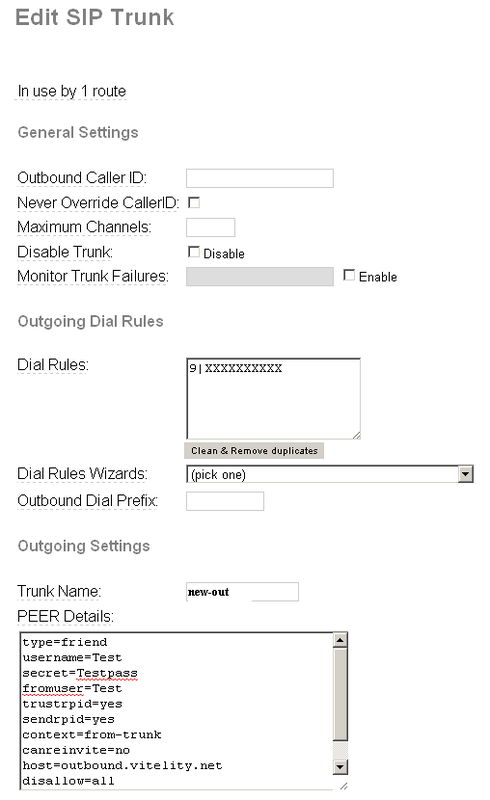 You then need to create a new outbound route that uses that new trunk. This route is identical to my default route save for the trunk selected at the bottom. I did discover that you have to set “ENTIRE Basic Internal Dialplan” and “All outbound routes” to deny if you want to be able to individually select outbound routes. Once everything is verified working, you only need to point your 800 number towards your new DID…yeah! Asterisk could be such a valuable tool for the work I do if it didn’t leave me pulling my hair out half the time; I’ve been installing and programming proprietary PBX’s for 10 years now but configuring an Asterisk platform to try out defeats me as often as not. I wholly agree with you sir! I’m endured more hours of frustration from these asterisk implementations than from anything else I’ve every jacked with. Having said that, they can also be pretty brilliant…hehe. If someone would just come out with a version that could mimic callmanager 4.3, it doesn’t even have to be a new version of callmanager, and have it be $1000…they would have a gold mine on their hands.